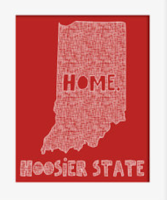 Living in the great state of Indiana who doesn’t love the movie Hoosiers? Are you too a Hoosier native and looking to rent a dumpster in the greater Indianapolis area? In this weeks blog we take a look at renting a dumpster in the Hoosier state! Our family owned and operated dumpster service Bin There DumpThat has the perfect junk removal solution for native Hoosiers looking to rent a dumpster! Whether it’s a small remodel or a large clean out you can count on us to haul away your unwanted items and junk! Now that you know how to rent a dumpster in the Hoosier state have you ever wondered how the Hoosiers got their name? There are actually several different theories but we think the folks at the Indiana Historical Society give the best explanation! Check out their story here on how the term Hoosier came about! Whether it’s downtown Indianapolis, the city of Carmel or in beautiful Avon, the next time you need a dumpster rental in the Hoosier state give us a call at 317-590-1973! Our family owned and operated business would love the opportunity to help you with your junk and trash hauling needs! When looking to rent a dumpster in Indianapolis don’t settle for second best, choose the quality of our always clean and green dumpsters! also Customer Service with our dumpster rental! Bin There Dump That Indianapolis offers same day delivery, unprecedented driveway protection and affordable quality with our always clean and green dumpsters. As a family owned andoperated business James and Lori Spink will ensure an A+++ experience when choosing Bin There Dump That! Whether you’re a residential or commercial customer in the Indianapolis area you can always count on the quality of our proven staff to get you the perfect size dumpster. From 4 yard dumpsters to 10 and 15-yard dumpsters to 20-yard dumpsters Bin There Dump That will have the perfect size bin to meet your specific needs. Next time your in need of a quality dumpster rental in the greater Indianapolis area give us a call at 317-590-1973. Our friendly and knowledgeable team will be more than happy to assist you! There are many options when it comes to renting a dumpster in the Indianapolis area but there is only one choice when it comes to a family owned and operated dumpster business, Bin There Dump That Indianapolis. Owners James and Lori Spink are local owners firmly entrenched in the greater Indianapolis community along with their son Kanon and dog Votto. Residents of Avon, Indiana on the west side of Indianapolis you can find James and Lori partaking in one of the area’s many trade groups including NARI Indianapolis Chapter, BAGI or Home Artisans of Indiana when not in their west side office. In addition the Spink family supports many charities in the greater Indianapolis area including the Make-A-Wish Foundation, the Indy Humane Society and the Fuller Center. The Spink family at a Reds game! When not working both James and Lori love attending sporting events and spending time with 3-year old Kanon and are members of the Kingsway Church in Avon. In just three short years the family owned and operated dumpster business has more than quadrupled in size! Despite this growth the Spink family has remained entrenched in their grass roots community minded approach. They are surrounded by a great group of team members many who have been with the Spink family since the doors opened and credit them for much of their success. Next time your in need of a dumpster rental in the greater Indianapolis area give the Spink family and Bin There Dump That a call at 317-590-1973. They will be more than happy to deliver one of their clean and green dumpsters to a residential or commercial job site in Indianapolis!